Today’s post is very special. It expresses friendship, love, and the foreshadowing of a possible murder. And here is where I thought he was going to be murdered. He explained how the previous year he completely forgot about his anniversary with his significant other. Just completely forgot about it. He even hung out with her that day, but not once did he remember. Surprisingly, he lived to tell us this event. When he did remember (as I recall, she told him around midnight that he had forgot about their special day) he was determined to bake a cake and beg for forgiveness. Let’s just say, baking a cake until 4 in the morning and then burning it while he tried to make up for his mistake, it was a long night. I figured he wanted to surprise his girlfriend this year with a nice cake to make up for the hardships he went through the previous year. And then he told me about the rest of his plan. I am happy to say it all worked out! Aside from spending his anniversary making a cake, he watched some Futurama with Dan and Éowyn. I would say, all in all, it was a successful day. He decided on a red velvet cake with vanilla buttercream. Simple, romantic, and delicious! I have been on a red velvet kick, so this was perfect for me. And it was a lot of fun showing someone how to make a cake from scratch (there were some comments about how much butter was in the icing, but I assured him it is what makes the icing so delicious.) He did an amazing job with the cake! Dan took pictures for us along the way because I was busy helping Travis with the cake and didn’t want to focus on too many tasks at once. We had a minor setback when Éowyn got all grumpy with Travis (it is hard to see in the picture but her arms are crossed and she totally has her back towards him!) but she is quick to get over her issues. 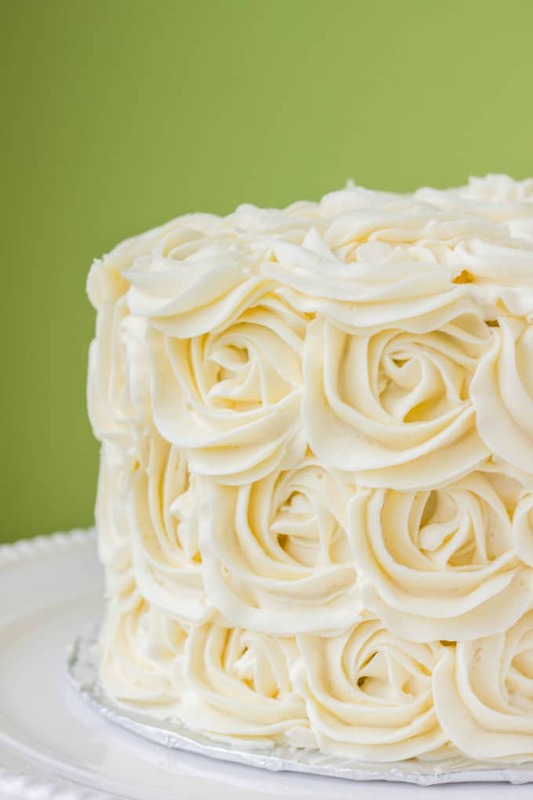 Now, most of the time a standard buttercream recipe makes enough to cover a 8 or 9-inch cake. However, depending on your piping technique, you could use more or less. 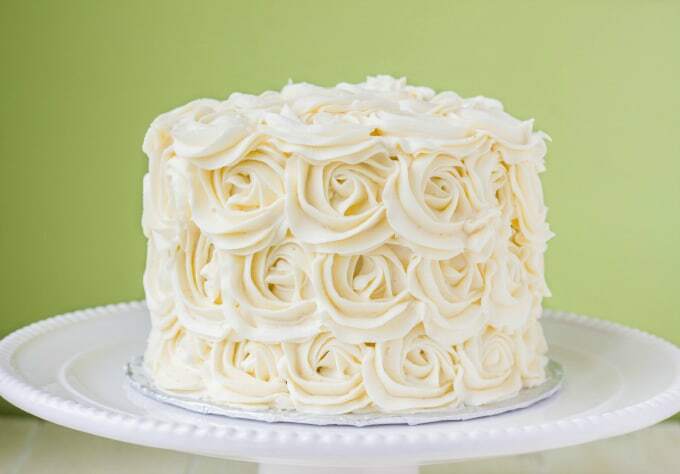 With rosettes, you use A LOT of buttercream. I made one batch of this icing and then had to make another half batch to finish the cake. I recommend doubling the recipe just to be safe. 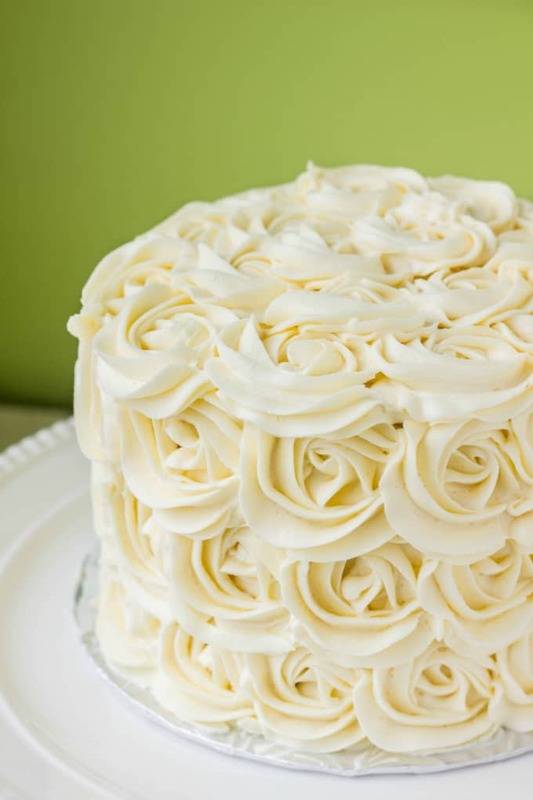 Nothing worse than running out of icing just before the cake is complete. And even worse, you will probably never get the colour matched exactly (thankfully we left the icing in its original state.) Just don’t say I didn’t warn you! The recipe for the red velvet cake can be found below the buttercream recipe. During the winter season, I have no problem making buttercream with all butter. There is a less likely chance of the icing melting with the colder temperatures, however, if you know you are going to be in a very warm environment, I suggest subbing in some shortening for the butter. Personally, I love an all butter buttercream, but sometimes changes need to be made. 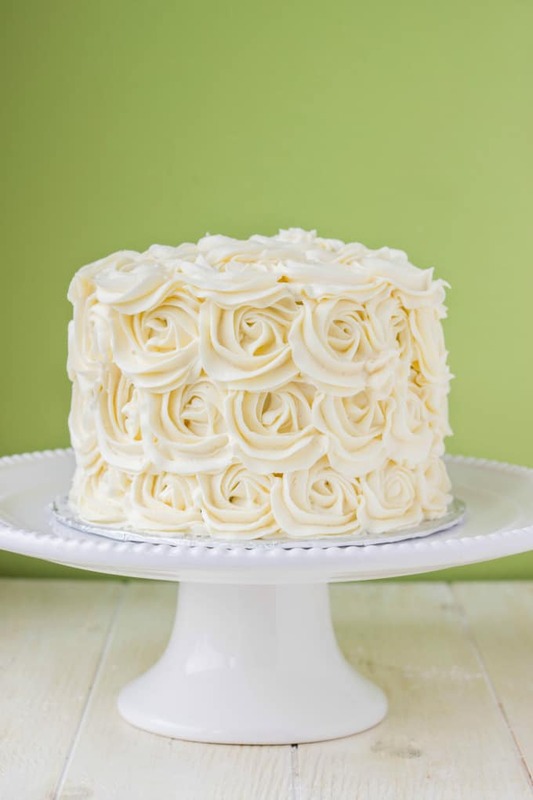 This red velvet cake with vanilla buttercream is very simple to make and is sure to be a crowd-pleaser. I especially like how it can be used as a Christmas cake as well because of the red and white contrast. Well, more like ivory with the colour of the butter coming through, but I prefer the look over a pure-white cake. Ha, the day I see my husband make me a cake... Though he does surprise me with couple's massages so that is a win! Wow that is a gorgeous cake! Love that he wanted to make her a cake. That's something I would love to receive! I thought it was super cute and romantic! 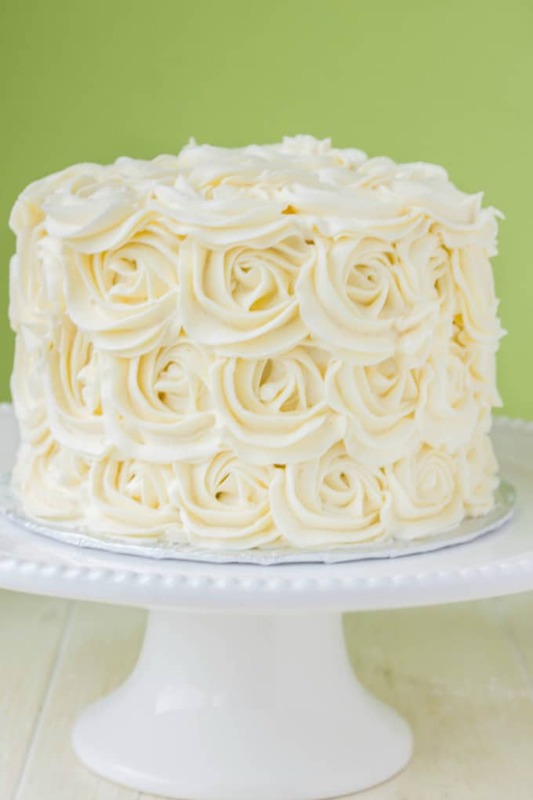 I love all-butter buttercream too and that cake is absolutely gorgeous! 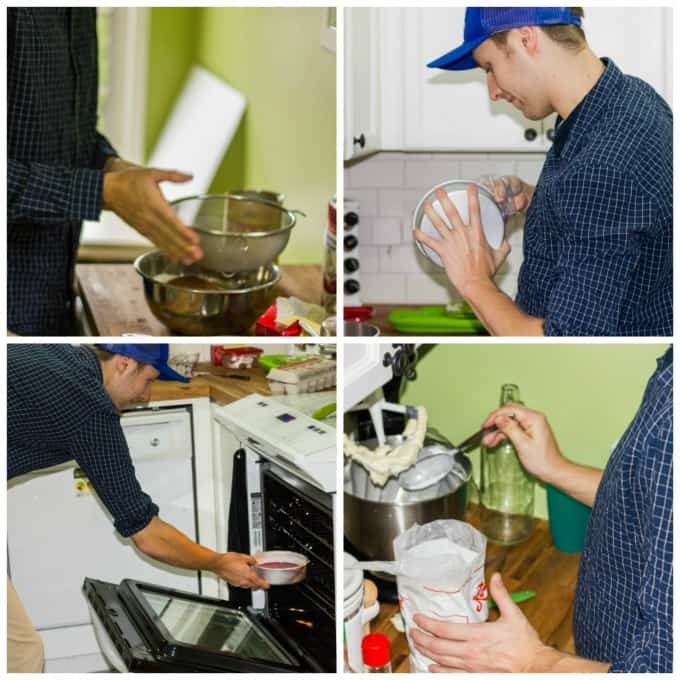 When can I sign up to take private cake making lessons with you?!! Beth, your desserts are absolutely gorgeous! I should be coming your way for lessons! Gorgeous cake! And what a fun story!